The training modules allow learners to practice how to distinguish the types of fire: Class A, B, C, D or F fires. In this case, it is a class B fire. Safety: This module should only be used with vegetable oil. The training modules for fire trainer allow to recognise the types of dangerous fires and learn how not to do the wrong things. In this case, it is important to never pour water on boiling oil on fire. In fact, it causes a dangerous explosion. The training modules for flame generators are perfect to familiarise the learners with all fire extinguishing situations such as computer screen fire, waste bin fire, deep fryer fire, electric cabinet fire, electric motor fire and oil explosion. This module allows trainees to observe the power and magnitude of an oil explosion and teaches them not to do the wrong things that could cause the explosion. In this case, it is essential to never pour/spray water on boiling oil on fire. In fact, it causes a dangerous explosion. 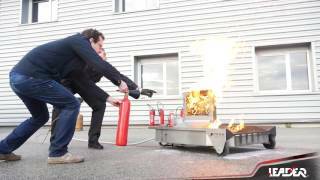 This LEADER fire trainer / flame generator module simulates an oil explosion!